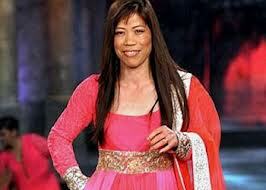 WHAT'S MARY KOM DOING ON A FASHION RAMP? Two days back, at a high profile fashion event in Mumbai held for the cause of Mijwan, Shabana Azmi's NGO based in Azamgarh in Uttar Pradesh had Olympic bronze medalist Mary Kom walk the ramp along with some of Bollywood's top celebrities and other important people from Mumbai high society. Mijwan is an enduring and endearing cause—linked with a cherished dream of Kaifi Azmi for their hometown in Uttar Pradesh—realised in more ways than one by his daughter Shabana. A fashion event with appearances by those who live by fashion or endorse it in their lives in various ways is a great idea like a well fitting glove. The clothes didn't suit her personality and if this was about fashion, she wasn't contributing to its cause in anyway. She may have received a thunderous applause as we are told but I find this co-relation uncomfortable. Not every winner need walk a fashion ramp to announce her endorsement of a cause, however noble. This cannot, after all, be the only way to lead a public life. Having her as a special guest in the front row would have have been a better way to make her a part of the event. Why Mary Kom should not think of acting in a movie that Sanjay Leela Bhansali plans to make on her. The writer argued why entertainment was not the boxer's primary commitment or nature of work and why her life's focus should be as clear instead of meandering. 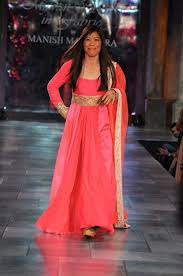 Here too on the ramp for Mijwan dressed in a Manish Malhotra lehnga ensemble, Mary Kom that's not the one we love and admire. Its at this time when she has the most offers for public appearances and endorsements that she must play the game in her own way and box out the blurring lines that could threaten to make her just one more celeb. Instead of being the one and only Mary Kom she is at the moment.